Recently, Google has launched unique accessibility services that help impaired people to easily communicate with the world around them rather than the device. One of these apps is called Sound Amplifier. This app enhances the sound from the surrounding environment and streams that to the earphones. It uses the on-device microphone to listen to the surrounding and then enhance the audio by removing the unwanted sound. Last year, Google brings the native support for hearing aids in the Android operating system. This feature streams audio directly to the supported hearing aids from the phone. This app is a great addition to that feature. 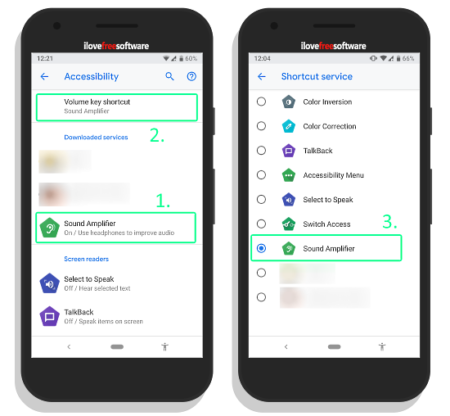 Sound Amplifier is an accessibility app that doesn’t have any interface apart from the settings. When you install this app from the Play Store, it got added to the accessibility services on your Android phone. In order to use this app, you have to assign it to the accessibility shortcut. To do that, go your phone Settings -> Accessibility -> Volume key shortcut and choose Sound Amplifier as the Shortcut service. Then, enable the Sound Amplifier service from the Accessibility. For that, go to Settings -> Accessibility -> Sound Amplifier and enable the Use Service toggle. You can do the same by holding both volume buttons for 3 seconds. 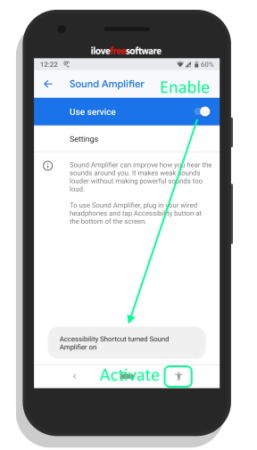 At this stage, you have set the Sound Amplifier as the active accessibility service which you can access with the accessibility button present at the navigation bar or at the bottom area of the screen. When active, the Sound Amplifier service uses the microphone to fetch the sound from the surrounding and enhance the audio by removing the noise. From the accessibility menu, you can access the settings of this app and personalize the options as per your convenience. From there, you can adjust the boost level for both channels (Left and Right) individually or combined. You can also add fine tuning to further enhance the audio. Along with that, you can adjust the mic volume to control the mic sensitivity. If you are getting too much sound, you can enable the “Reduce unwanted sound” mode which faints the noise. 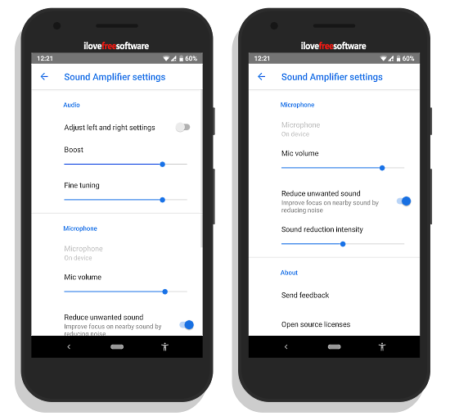 Below this option, you can control the sound reduction sensitivity as well. Install Sound Amplifier from the Play Store. Sound Amplifier is an audio enhancer that can be really helpful for the hearing impaired and near-deaf people. Combined with the native support for hearing aids in the Android, this service can really change the life of people with hearing impaired. Do note that, this service works with wired earphones (with or without mic); it’s not compatible with wireless earphones (yet).